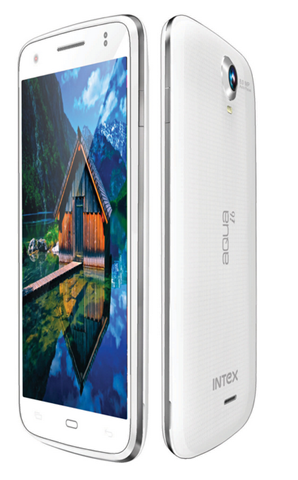 After launching Full HD, MT6589T Flagship phone Intex Aqua i7(Quick Review), earlier than others, Intex has now launched a budget quad core device, Intex Aqua i6 with MT6582 chipset in India before the others, priced at Rs. 8,990. Let’s see what this new offering from Intex brings to the table. This processor was first announced in Lenovo A850 last month and is not yet available. This phone is powered by MT6582 processor which is new low cost solution from MediaTek. The processor is based on Cortex A7 ARM architecture similar to MT6589T and is clocked at marginally higher 1.3 GHz. The GPU used is Mali-400 MP2 GPU which has 2 cores clocked at 400 MHz . The RAM capacity is 512 MB which is little disappointing. The internal storage remains 4 GB and can be further extended to 32 GB. Intex will also give you 5 GB of storage on the cloud. The Display is 5 inches in size, but the resolution has been trimmed to accommodate the low cost. Screen resolution is FWVGA which will provide you with 854 X 480 pixels display which is again above average considering the price range. The pixel density will be 196 ppi. The primary camera is of 8 MP and is supported by LED flash. The secondary camera of 2 MP is also present for video calling. On the software front this phone comes with Android 4.2 jellybean operating system. The battery capacity is 1900 mAh but looks like the frequency scaling took its toll on the battery as you will only get 6 hours of talk time and 220 hours of standby time which is below average. Connectivity features include 3G, HSPA, WiFi, etc. It also comes with various preloaded apps including Bigflix movie App and Matrabhasha. This phone also suppirts Dual SIM functionality. We expect many more of these MT6582 and MT6582M processors to show up in India in the next couple of months. The processor looks good on paper, but only 512 MB RAM is disappointing. We will have to wait for the benchmark results to know for sure how this will actually perform. Xolo Q700 and Xolo Q800 are other quad core devices selling at this price range. Numerous Dual core phones which we have seen recently will face a strong competitor.